The deals were signed Monday in the presence of French President Emmanuel Macron and Chinese President Xi Jinping, on the occasion of the latter’s State visit to France. The 10 new Chinese-built 15,000-TEU (Twenty-foot Equivalent Units) vessels will each measure 366 meters long. They are scheduled to be delivered to the French shipowner from 2021, replacing 10 other vessels for use on the Asia-Mediterranean lines. 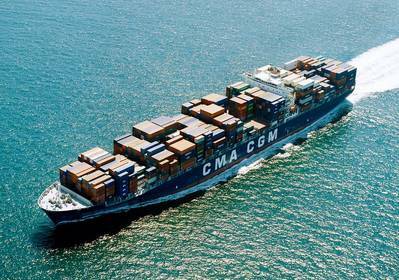 CMA CGM Group opted to power half of these newbuilds with liquefied natural gas (LNG), which allows for reductions in CO2, sulphur, fine particles and nitrogen oxides emissions, it said. The five other vessels will be fitted with hybrid scrubbers, allowing for the elimination of sulphur and fine particles emissions. Under the second agreement , the partners will cooperate to develop more efficient and environmentally-friendly vessels. “Through this strategic partnership with the China State Shipbuilding Corporation, we once again opt for LNG propulsion and we reinforce our efforts to develop ever more efficient and environmentally-friendly vessels. We thereby reassert our leading role in the energy transition of the shipping industry,” Saadé said. In November 2017, the CMA CGM announced an order for nine 22,000-TEU containerships powered by LNG, becoming the first shipping company in the world to choose this energy source for vessels of this size.